As we all know, small men spend a great deal of their free time stealing cookies. 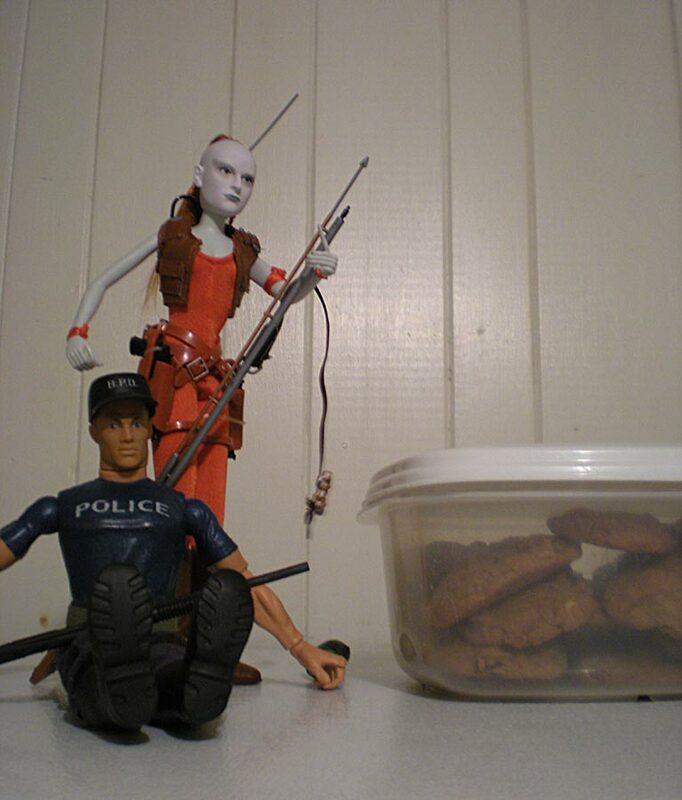 My cookies are well guarded by fiercely protective and armed action figures. You’ve been warned. I baked these a couple of night ago. I got sixty units out of the mix, which is a scant serving for a giantess and a lifetime supply for a shrunken man. Either way, they are delicious, and I don’t feel the lack of oatmeal one bit. Using an electric mixer, cream butter, brown sugar, and vanilla. Stir in flour, baking soda, baking powder, cinnamon, and salt. Mix well. Drop the walnuts and raisins into the mix and continue beating at low speed until all ingredients are incorporated. Drop by tablespoons onto baking sheets. These can be greased, or lined with parchment paper. Bake at 350° for 12-15 minutes. Cool on wire racks.